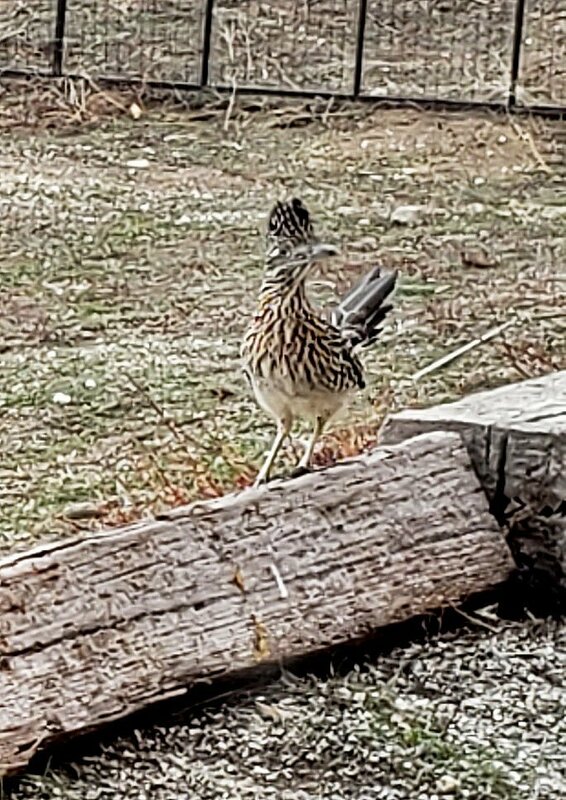 A Greater Roadrunner in Bear Valley Springs. Roadrunners are mostly carnivorous and insectivorous. Natural Sightings: Beep beep, Bear Valley! 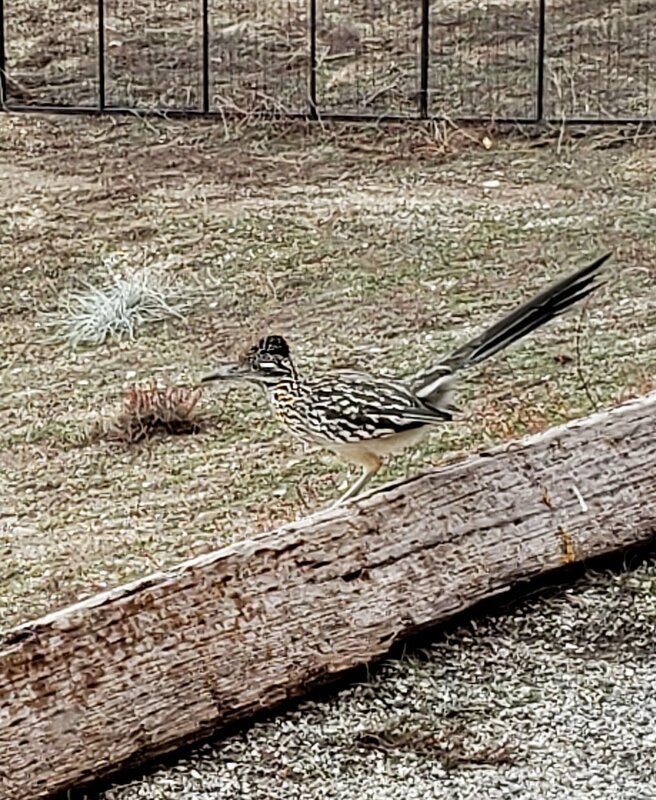 Maria Blasko took these photos at her home in Bear Valley Springs of a Greater Roadrunner (Geococcyx californianus). 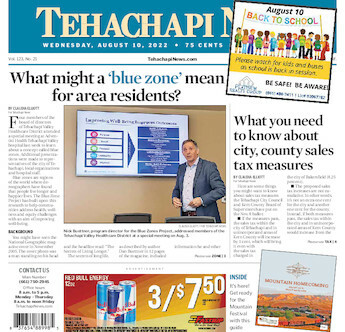 These distinct and unmistakable birds are found throughout the Tehachapi Mountains in a variety of environments, though in most people's minds they are mainly associated with arid, desert habitats with cacti and dry washes. The strange-looking genus name of this famous bird means "cuckoo of the earth" or "ground-dwelling cuckoo" and is pronounced "geo-cox-six." Despite the fact that they are true members of the cuckoo family and not raptors, Roadrunners definitely possess raptorial tendencies and are capable of killing rattlesnakes. Roadrunners are mostly carnivorous and insectivorous, eating snakes, lizards and other reptiles, frogs, insects, eggs, birds, chicks, carrion and more. In winter they do include fruit, berries and seeds in their diet, and they may visit backyard bird feeders, though they be more hopeful about grabbing a small bird at the feeder, rather than eating the seed itself. Roadrunners can move very quickly on the ground and can outrun a human being, but cartoons aside, they cannot outrun coyotes, which have been clocked at more than 40 miles per hour. Roadrunners can manage to escape coyotes through a combination of flight and evasive maneuvers, but they can't simply outrun them. Roadrunners are highly esteemed by many Native American peoples, and some Pueblo tribes use an X symbol, representing a Roadrunner's footprint, to ward off evil. The Roadrunner's distinctive foot configuration, with two toes pointing forward and two pointing back, forms an X pattern and makes it difficult to tell which direction the bird is traveling — discouraging bad spirits from following. The Nuwä (Pauite or Kawaiisu) word for Roadrunner is iyip, pronounced eye-YIP.